SCP-470 before establishment of SCP. Special Containment Procedures: No items or personnel are to enter or exit SCP-470 or the external containment area without approval by Site Command. Anything entering SCP-470 must be examined both before and after contact. Anything exiting SCP-470 is to be contained and examined, resistance by any items or staff to this process may be overcome by whatever means deemed necessary by Site Command. Any staff entering SCP-470 must be equipped with a long-range GPS tracking bug. Staff entering SCP-470 are to remain in groups of no less then twenty (20) at all times. Should staff become separated, [DATA EXPUNGED], or any combination thereof, they are to immediately exit SCP-470. Area recorded on ██/██/████. Manifested for three weeks, before shifting with Recon Team B-11. Team listed as "MIA"
Description: SCP-470 appears to be a large abandoned office building in ████████, ███████. SCP-470 has had no registered owner since ████, when it was abandoned with the collapse of the ███████ Corporation. The building is seven floors, including basement levels, and in a general state of disrepair consistent with its term of abandonment. 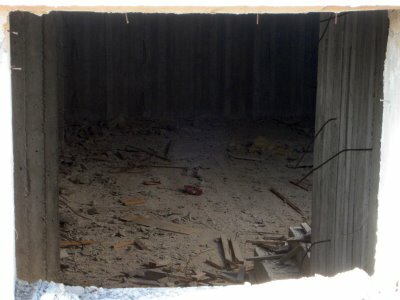 SCP-470 appears to be (or to house) a dimensional anomaly, causing its internal rooms to “shift” and become other locations that have been “abandoned” for extended periods of time. The ability for an outside location to appear within SCP-470 appears to manifest after twenty and thirty years of little to no human observation, interaction, or habitation. This anomaly appears to be limited to the rooms of SCP-470, with the halls remaining primarily stable. The rooms of SCP-470 appear to exist both in their original physical location and within SCP-470 simultaneously. 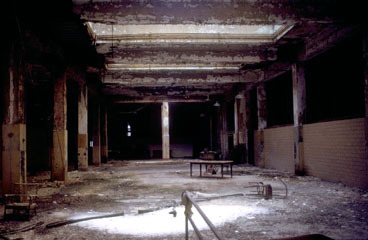 All rooms appear to be internal locations, such as store rooms, abandoned offices and factory areas, with no external locations such as abandoned lots or storage yards ever recorded manifesting inside SCP-470. Manifested rooms appear to be “cut off” from their original surrounding locations, with all doors besides the “entry” door opening up to blank brick walls of the same construction as SCP-470. These locations appear to be unstable, and will “flicker”, ceasing to exist within SCP-470 at random points, and remaining unmanifested for random periods of time before manifesting within SCP-470 again. Anything inside a room when it unmanifests will be transported with the room to its original physical location. This process also works in reverse, as any objects inside the room will be present when it manifests inside SCP-470. The “flicker” rate appears to vary, ranging from six seconds to several years. Addendum: It appears possible to remove a room from “rotation” by increasing the level of observation and activity inside the original physical location of the room. The longer an area is left outside of observation or activity, the stronger the “connection” with SCP-470. Initially, rooms are able to shift only when no humans are present, or actively observing the area. After longer periods of abandonment, rooms are capable of shifting with as many as fourteen people inside. The danger of SCP-470 comes from the fact that some of the rooms do not appear to originate in our reality, dimension, or time-space. Some are constructed of non-terrestrial elements, or have items that parallel with no known technology or construction. For example, [DATA EXPUNGED] at least 80% organic, with the non-organic portions showing signs of infestation. Also, there have been four recorded escapes by “beings” transported by shifting rooms within SCP-470. Notably, “Subject R” remains at large within SCP-470 itself, and is thought to be responsible for some of the deaths recorded inside SCP-470. The death toll currently stands at eight staff and forty-five civilians at last estimation, with several hundred more listed as “missing”. Many of the civilian deaths and disappearances are attributable to youths “exploring” abandoned areas when they shift into SCP-470, becoming trapped inside, shifting inside a different room, [DATA EXPUNGED], or other dangers that may be inside manifesting rooms. Addendum 2: As of 25/11/2016, a total of 38 instances of rooms located within decommissioned SCP Foundation facilities have been observed within SCP-470's rotation. Most notable of these are several rooms from the top basement levels of SCP-1730 following the initial cessation of exploration attempts by Foundation personnel. Attempts to remove these rooms from rotation via observation of the facilities is currently ongoing.